Here’s the thing… I love pie. Love, love, love it! 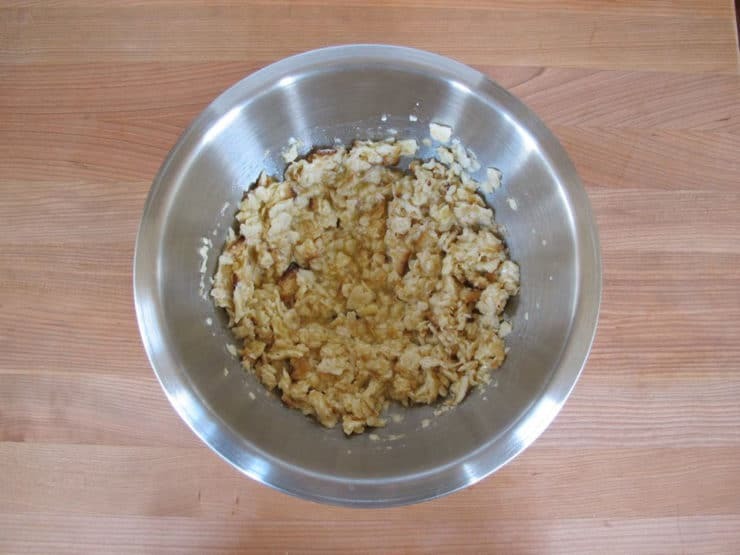 But at Passover, when leavening is not an option, making a tasty pie crust becomes much more difficult. This recipe evolved out of my need for a Passover pie substitute (because let’s face it– it’s really, really hard to get through an entire week without pie). I did away with the crust entirely and instead relied on matzo cracker crumbs to hold the filling together. The result is something between an apple crumble, a pan dowdy and a pie. Whatever you want to call it, it’s delicious! 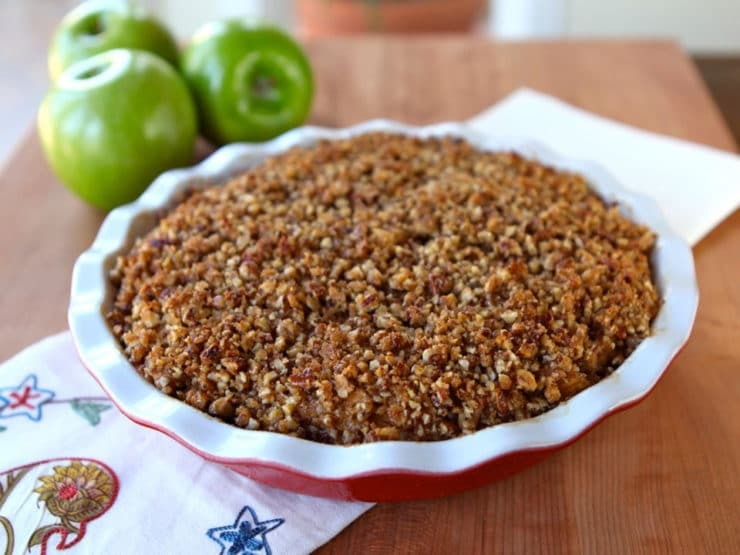 Bake this Passover dessert in an old-fashioned pie dish, and nobody will complain about the missing crust… the flavor is very similar to a nutty apple pie. The candied pecans add a crunchy sweet topping to this decadent Passover treat. Serve ala mode for extra deliciousness. Recipe for Passover Pecan Pie made with chopped apples, sugar, matzo crackers, spices and chopped pecans. Kosher for Passover, dairy or pareve. 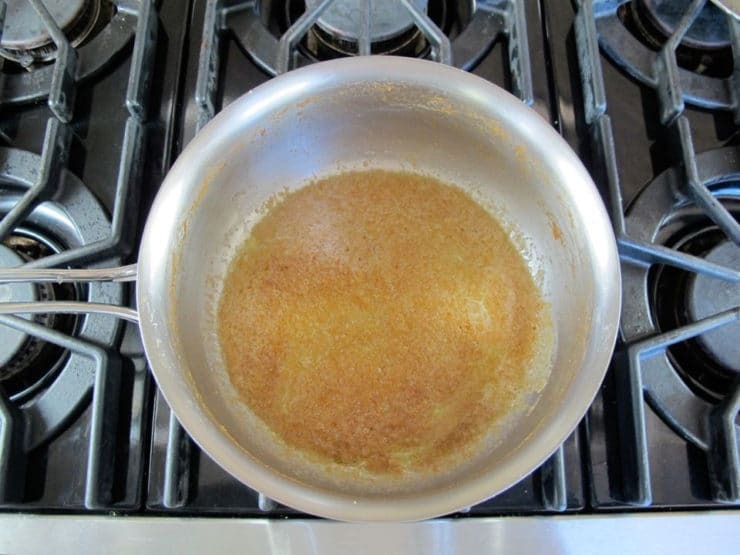 Preheat oven to 350 degrees F. In a medium saucepan, melt 2 tbsp butter or butter substitute. 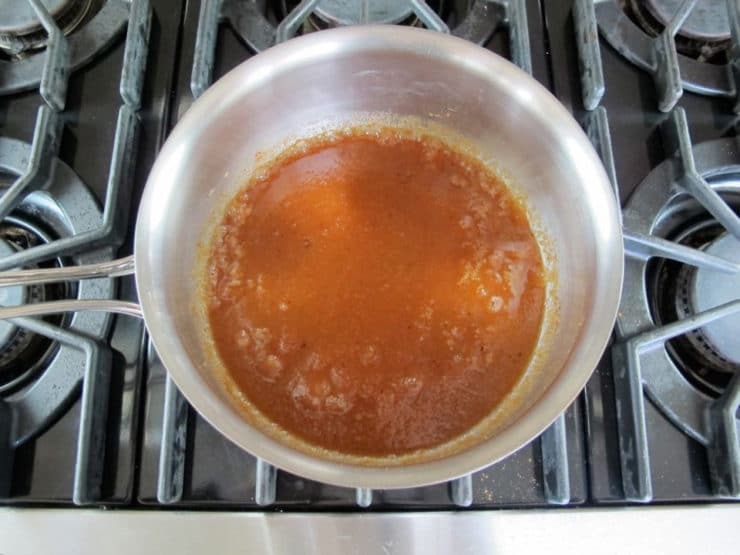 Add applesauce, white sugar, 2 tbsp brown sugar, vanilla, cinnamon, nutmeg and lemon juice. Stir till well combined, then bring to a boil. Passover Note: If you're making this dish for Passover and you're keeping strictly kosher, make sure your packaged products are certified Kosher for Passover. This pie was the star of our Pesach! And I didn’t have any applesauce, so I used a food processor to grind up the leftover charoset and used that instead – tasted AMAZING and repurposed my leftovers! thanks !! Great idea with the charoset! This pie was absolutely delicious and a huge hit! I assembled it two days ahead, removed from the refrigerator 30 minutes prior to baking, and baked for 50 minutes. It turned out perfectly. I plan to make it again, even not for Passover. hope you’re enjoying a Happy Pesach, I really look forward to your delicious recipes. Is it better to assemble the day before, refrigerate and cook it for the first time right before you serve it as opposed to reheating? Yes, I would assemble it ahead and cook it fresh instead of reheating if that is an option for you. Made exactly as per recipe except used 4 gluten-free matzot instead of 3 regular. This was a huge hit at our seder and is definitely a keeper! Good to know this held up with GF matzo too! I made this for pesach this year thank you so much for sharing it with us . It was a big hit and so delish . def doing it again next year ! For a Passover cheesecake. My niece’s B/day falls around passover. Cheesecake is her favorite. I had the idea to use macaroons as the crust, Used almond flavored, pressed them into my spring form pan w/pam spray, made my usual cheesecake receipe baked it as usual. Added sugared strawberries on top. It Turned out fabulous family loved it . And my niece had her favorite. Hi Dvora, Tori’s assistant Ashley here. This recipe uses egg as a binder, so it’s an important ingredient. 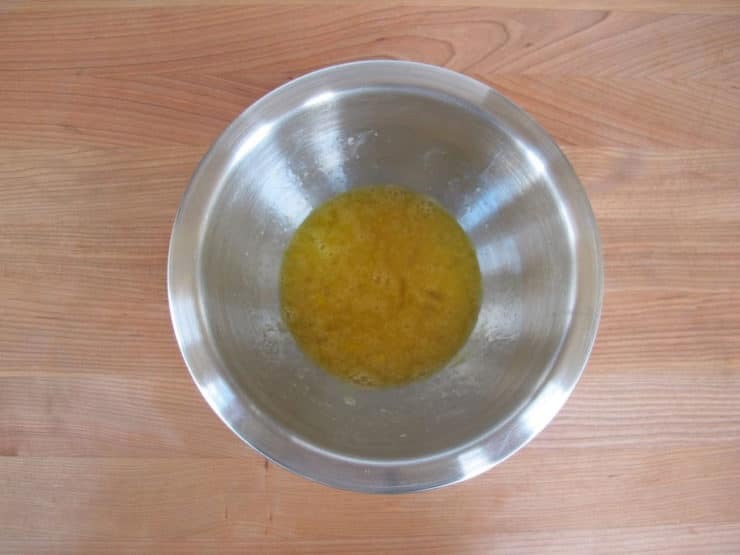 We have not experimented with a vegan version, however we do have a tutorial for vegan egg replacements that you might might want to give a try. Since we have not made it this way, I cannot guarantee it will turn out. Hi, I would love to try this delicious looking pie, however we have nut allergys in our family. I was wondering if the topping can be made with matzo farfel instead of the nuts. Sort of like a “Matzo Crunch” type topping? Tzipi, I think this would probably work out fine… however I haven’t tested it myself so I can’t give you specific advice here. Hi, I’m a beginner baker and want to try this to take to Seder. Can I use a 9″ spring form pan? Do I need to make any adjustments to the directions? I have only baked this in a pie dish– a springform is for recipes like cheesecake, which will keep its structure when you remove the edges. This pie recipe will hold up better in a pie dish, if you can find one– or, in a pinch, you could use a 9×9 baking dish and make it more like a crumble. I don’t recommend a springform, though. Good luck! I made this tonight, but I halved it it because it’s just for my hubby and me. I also used Macintosh apples because that’s what I had. It was delicious! I plan to make it for my Seder next year. Didn’t really taste like a typical Passover dessert. Really great. Thanks so much. I’d love to make this pie for my in laws for Passover. They live approx. 2 hours away. So I’m trying to determine the best way to go here….to make the pie ahead of time and just reheat it (which I would then ask how best to reheat) OR, could I make it a day before, refrigerate and bake the pie when I get to their place? Hi Eva, either option is fine although if you decide to bake it at the in laws (which will make it taste a bit fresher) make sure you keep it cool on the way to their house– perhaps in an ice cooler packed with ice. The risk of food borne illness at room temperature gets significantly higher after 2 hours. If you decide to reheat (although it can be served cold!) pop it in the oven at 325 for 15-20 minutes or until warmed through. Enjoy! Can an eight or nine inch round pyrex dish be used? Marcia– yes. 8 inch might be a bit small for this recipe but 9 inch should work fine. Could you use matzo farfel instead of making your own “crumbs?” It seems like it would save time and I always have leftover fafel. Hi Merryl, yes! I think about 1 1/2 cups of matzo farfel should do it. Enjoy! Would gluten free flour be kosher for Passover? Hi Marcia, I’ve never seen a gluten free flour that is kosher for Passover. You would have to look at the kosher certification to see if it covers Passover. There are some gluten free matzo meal and matzo cake meal brands, however, which might be a better bet. Whole Foods and many other specialty retailers are selling them now, and you can also find them online. Good luck! Make this pie for Passover this year,,was a very big hit with my family…Them made it better for the last day of passover for friends…I did a little twist added dates…Wonderful pie…2 thumps up..! Thank you for your beautiful Apple Pecan Pie recipe.This is my first time at cooking Passover food and I really appreciate your brilliant and helpful site. Big hit for our Seder! Thanks for the fab recipe. Hi Tori! I wanted to let you know that I made the pie in a 9 inch round cake pan and it was perfect and delicious! I can’t wait to try it with vanilla ice cream! Great Barbara! Thanks for letting me know. Hi Tori! What other dish can I make this in? I don’t have a deep dish pie pan and don’t want to buy one. Hi Barbara– you might try an 8-9 inch round cake pan or an 8×8 square pan. I’ve never tried either so please know that you may have a little too much filling for either of these options, but they should be roughly the same in terms of the volume they hold. Hi, What other topping can I use if I don’t want to use nuts. Also can the pie be made one day ahead of time? Hi Oraneet, yes the pie can be made one day ahead. It tastes best reheated. I’ve never made it without nuts and I’m not sure what substitution to recommend. Usually I recommend sunflower seeds, but here I’m not sure if it will work in terms of the flavor, and they are also considered by many to be kitniyot (if you’re making this for Passover- if not, this wouldn’t be a concern). 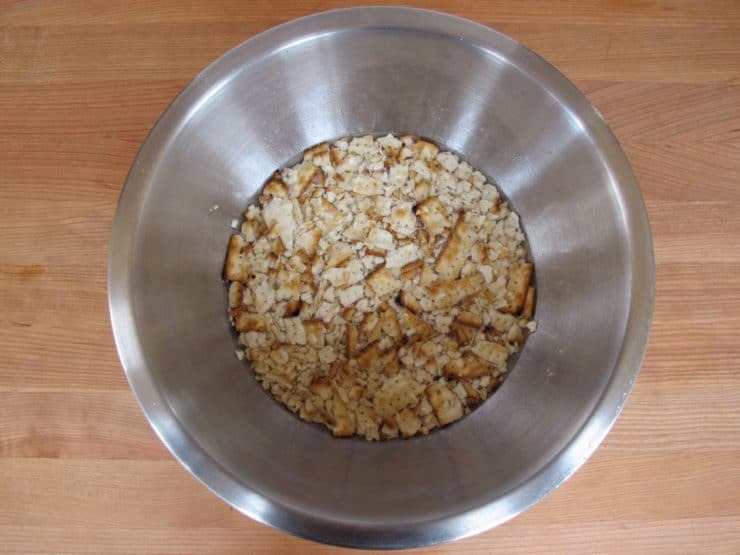 You could try a streusel topping without nuts, however most contain some kind of flour to help bind them. If I think of a good sub I will post back here. This baby is in the oven right now! Planning to serve it tomorrow for our late passover meal. High hopes! The nuts weren’t really sprinkle-able once they were coated. The coating was too thick…but, they look nice in scattered clumps too! Enjoy flossy! 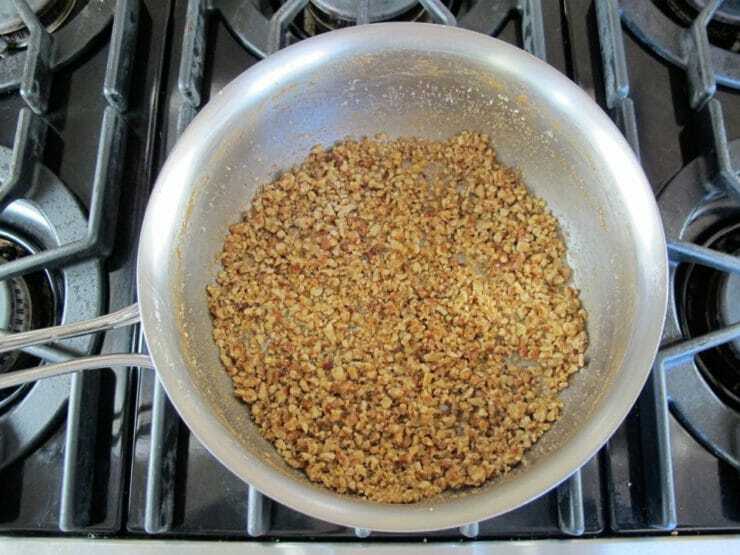 You may have cooked the nuts a bit too long, they should be easy to break apart and sprinkle. The longer they sit over heat, the more “candy-like” they become, which means they’re harder to break apart. I made this pie for a special dinner and was a tremendous success. Everybody like it, even the Kids! Truly recomended. I only have one issue with this pie! I tasted the filling before completing the recipe so I would know if I wanted to continue and I had to make more filling because it was so very delicious. Can’t wait to serve this. Thanks. This recipe looks great. Can the pie be frozen and reheated? How would you recommend reheating the pie if it has to be transported to a family’s house! Hi Blake, from the fridge, reheat the pie at 325 degrees F for 15-20 minutes, or until heated through. I baked this last weekend for our seder and it was fabulous!!!! I chopped the apples (by my Cuisinart) much smaller than your photos, and it came together more like a cake, than a pie. This is a recipe that will be made again next year. It was a hit! I dont have any applesauce for Pesach in the house. Can I just leave it out. I dont feel like making any either! Id like to try this tomorrow for the last days. I hope you have time to reply. Hi Denise, the applesauce adds moisture and helps to bind everything together. 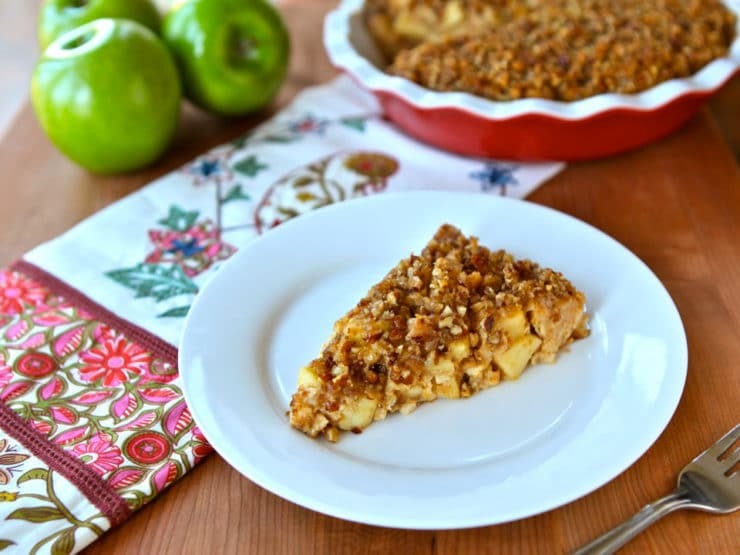 You can try making it without it, just know that it will probably not hold as well together– it will likely have a texture that is more similar to an apple crumble than an apple pie, and may not be as clean to slice (it may fall apart a bit). It should still taste good– no promises on the texture, though. 🙂 Chag Sameach! I made the pecan apple pie for our seder. It was a huge favorite. Everyone loved it. I will make it again for the end of the holiday. Thanks, Tori! The apple pecan pie was a huge hit at our seder. My husband loved it so much he said I could make it anytime. I have really enjoyed the Passover Potluck. I’m sure many of the recipes will appear on our table for many years. Made this with gluten-free matzah and wanted to let others know it still came out wonderful. This is a keeper for a Passover dessert. Served pie for dessert last night. Was delicious, however, did not slice well. It totally fell apart. I’m having it for lunch with cottage cheese. Hey Jackie! Glad you enjoyed the pie. Next time, try baking it for 5-10 minutes longer (the longer the better), and let it cool completely before slicing. That should solve the falling apart problem. 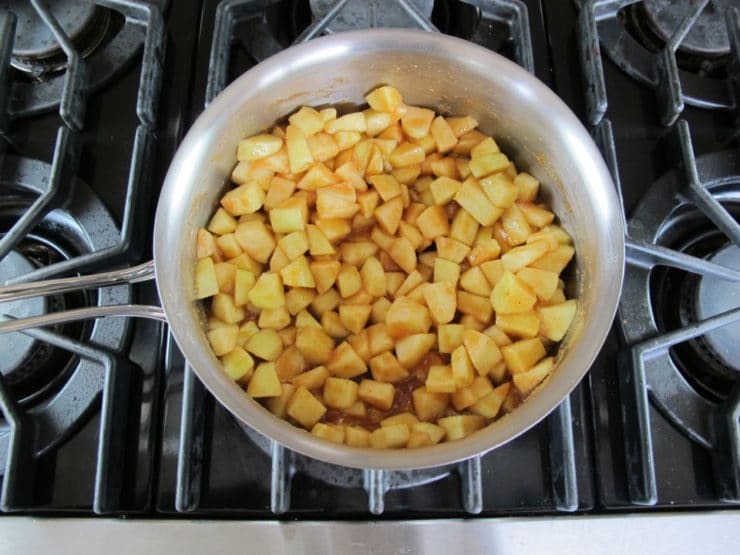 If not, you could add another egg to the apple mixture, which will help to bind it. Just made the pie. It looks incredible. Now on to Charoset balls! Already made the brisket & put in freezer. Just to clarify, it’s not without wheat; matzo contains wheat. It is, however, made without leavened grains and therefore kosher for Passover. Oh my goodness gracious! Now I can’t wait for the 2nd night at our synagogue. I think I will be very popular! I always put the recipe next to the dish I bring. I’m sure you will have some new fans! What is the reply for advance making and storing this pie? Can it be frozen? Hi Sue, hi Jackie– I have never frozen this pie before, so I don’t know how it will hold up. I want to say it should be fine based on ingredients, but I can’t promise because it’s a rather unique creation– the filling is like nothing I’ve ever created before. I do know that it holds up very well in the refrigerator, so perhaps you can make it a couple of days ahead and refrigerate, then reheat before serving? If you do try freezing it, please let us know how it works for you. Can this made in advance & put in freezer? Would love to try the apple pecan pie. How far in advance can it be made, and how should it be stored if there is any left over. I don’t mean to be picky but paté brisé (pie crust) contains no leavening. It is, however, best made with lard which could pose a problem for some Jews, but solid vegetable shortening has been used to make successful pie crust for generations of kosher keepers. Flour, shortening, and ice water. No dairy, no animal fat. Why work so hard to get around it with crushed matzos? Tori, sorry this response took so long but, the Passover Apple Pecan Pie was wonderful! There wasn’t a crumb left over and everyone loved it! Thank you so much! Can I use Israeli Matzos? I could not find egg matzos anywhere. Is there any way to adjust for the missing egg? Hi Michelle– Israeli Matzo is fine, no need to adjust for the missing egg. The egg matzo flavor is a personal preference, but it will work equally well with regular matzo. Nag– I’ve never made this outside of Passover, so I’ve never tried a sub for the matzo. If I find a suitable one I’ll report back. Fab passover recipe…so delicious and easy I would make it all year long! What would you use in place of the matzah? I’m sure I’m not saying anything new around here but well done. I’ll try this soon. I have always been interested in trying a pie for Passover since I am a major pie baker. This might be something I will try this year! Your entry inspired me, I already had all the ingredients in the house! So I just decided to go for it! My kids came home from school and devoured it! The kitchen smells amazing! Your right Tori you just can’t go through a whole week without pie!!!!!! Thank you!!!! Shirley, glad the fish worked out for you! Kelly, I don’t really think this pie can be considered low-cal… it might be a tad healthier than a fully crusted pie, but if you’re looking for a healthy dessert healthy dessert I wouldn’t suggest this one. I’ll provide some lighter suggestions before Passover! 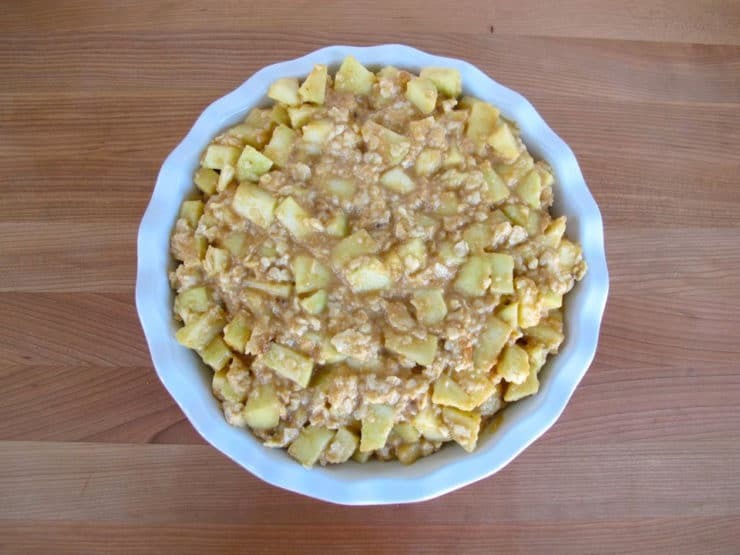 I do not prefer apples or apple pie, but I would love to try this Passover pie concept. 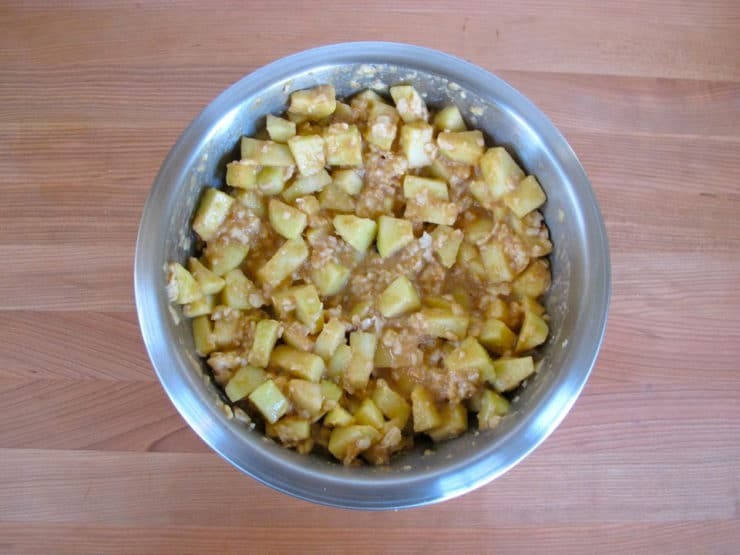 Are there any fruit substitutes you would recommend for this recipe? I tried the Moroccan fish with halibut for my husband last Friday. You were right, it was just fine with the regular Paprika I got from my King Kullen market around the corner. Thank you for your personal advice. I enjoy your recipes. This isn’t about pie, but wanted to let you know the green bean pepper salad was a big hit! Especially with my oldest daughter, who is not usually a veggie fan.